Remember the "fat-free" baked good craze? Or the fairly recent acai pandemonium? People naturally become skeptical when foods are overhyped in the media, but there are plenty of health foods that are not fads -- no matter how much the media raves about them. But just like every media darling, these foods are better when paired with equally-impressive partners. These pairs have real chemistry -- a sort of molecular magic happens and their healing antioxidants become more readily absorbed or become exponentially more potent. Sort of like the Brangelina effect! Kale may no longer be in the "it" food next year, but regardless, it should always be a staple in your crisper. Some skeptics say kale is on the cooling list when it comes to trendy, but it's still the "Fendi" of health. It will always be a very hot health food because it contains powerful molecules that do amazing things in our bodies. Take glucosinolates for example, a class of water-soluble compounds that stopped cancer cells in their tracks in animal trials. Kale also contains special fiber that are activated when cooked -- whisking fat and dietary cholesterol out of your body before it's absorbed. Skip store-bought kale chips though -- many delicate antioxidants and water-soluble compounds are damaged when foods are shelved for extended period of time, and store-bought kale chips come nowhere near the flavor and freshness of the home-made version. Instead, make your own kale chips or these awesome kale fudge pops, courtesy of 50 Shades of Kale, to pair kale with its synergistic partner, fats! 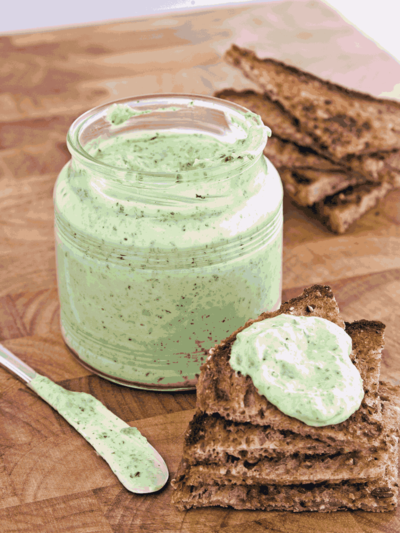 Of course, use healthy fats like olive oil, nuts, seeds, or even a pat of pasture-raised butter. Tall, dark and handsome, dark chocolate is touted for its ability to calm blood pressure and deliver antioxidants in the form of flavonoids, but this is only the case with chocolate bars and sweets that contain at least 70 percent real cocoa. Unsweetened cocoa power is 100 percent dark chocolate, so no need to read the label to figure out its cocoa percentage -- it's the real deal! Luscious, sweet red apples are the perfect pair with dark chocolate, because apples contain quercetin, especially in their skins. Quercetin has been invoked to reduce the risk of allergies, heart attack and a host of other ailments because of its dual-action as an antihistamine and an anti-inflammatory. When quercetin meets catechin in chocolate, magic happens: Because together they may improve cardiovascular health. Think of turmeric as the bad boy of spice: He's tart, powerful, and has many talents, including the ability to soothe skin disorders like psoriasis, calm the nervous system and PMS, and even potentially fight cancer because of its active ingredient curcumin (which works as a powerful anti-inflammatory). There is fascinating research that also shows turmeric might suppress fat tissue growth. Turmeric's perfect pair? A tall hottie, a big warm glass of milk! Apparently both heat and fat make turmeric more bioavailable and thus more potent. Quinoa, sometimes presented as a weight-loss food, is a mighty seed that comes from a plant still cultivated in South America. It might be hard to pronounce (ki-nwa) but there is nothing difficult about cooking it or reaping its nutritional benefits: Rinse quinoa well and cook it just like rice (20 to 25 minutes, one part quinoa to three parts water). Quinoa is a complete protein and has all nine essential amino acids, great for a vegetarian diet. It's very high in manganese that helps keep bones strong and healthy, great for men's health, and high in iron. Quinoa also contains niacin, which has been proven to lower cholesterol and triglycerides. Bright, red and flashy, red bell pepper is quinoa's match, since red bell pepper is high in vitamin C that promotes iron uptake. 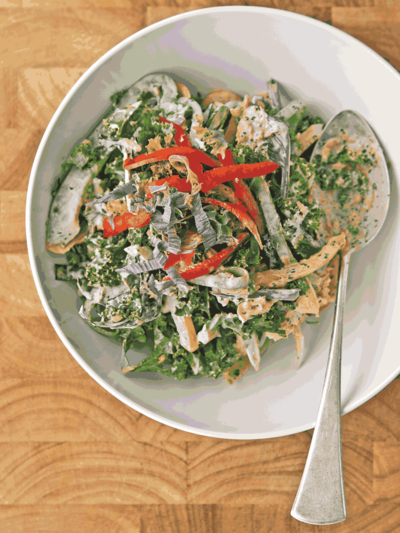 -- In a large saucepan, combine all ingredients except kale and add the warm water. Bring to a boil, then reduce the heat and simmer for 2 to 3 minutes stirring occasionally until the mixture is smooth and thick. Remove from the heat and cool to room temperature. Place kale in a food processor and pulse until finely chopped. 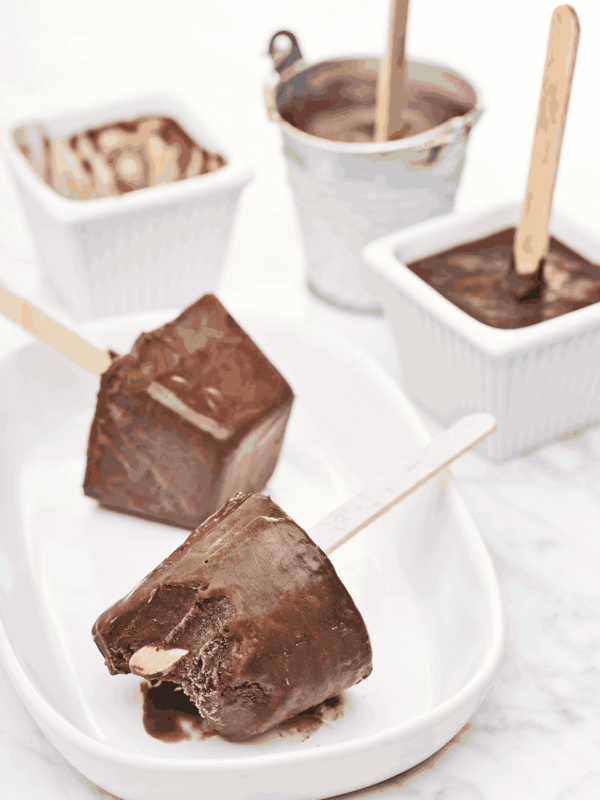 Stir the kale into the chocolate mixture and divide it among 8 ice pop molds and insert ice pop sticks. -- Freeze for at least 4 hours before serving. 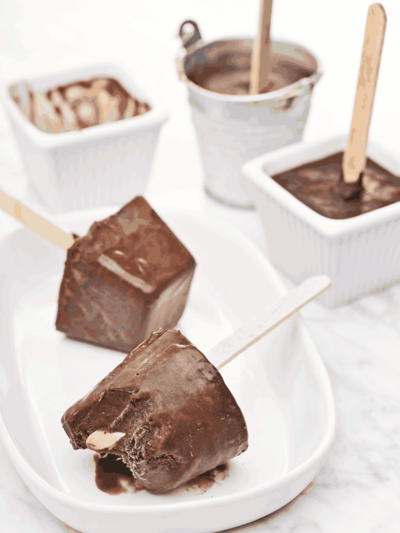 The pops will keep for up to 3 weeks in an airtight container in the freezer. In a food processor, combine the kale leaves, salt and garlic. Process until finely chopped. Add in the mayonnaise and lemon zest, lemon juice and process until smooth. DID YOU KNOW? Fresh garlic, like kale, contains sulfur compounds that become more available to your body after crushing the cloves or mixing them with lemon juice. Garlic has been shown to help protect the heart and the brain by lowering the inflammation in blood vessels. -- Fit a food processor with a shredder attachment. 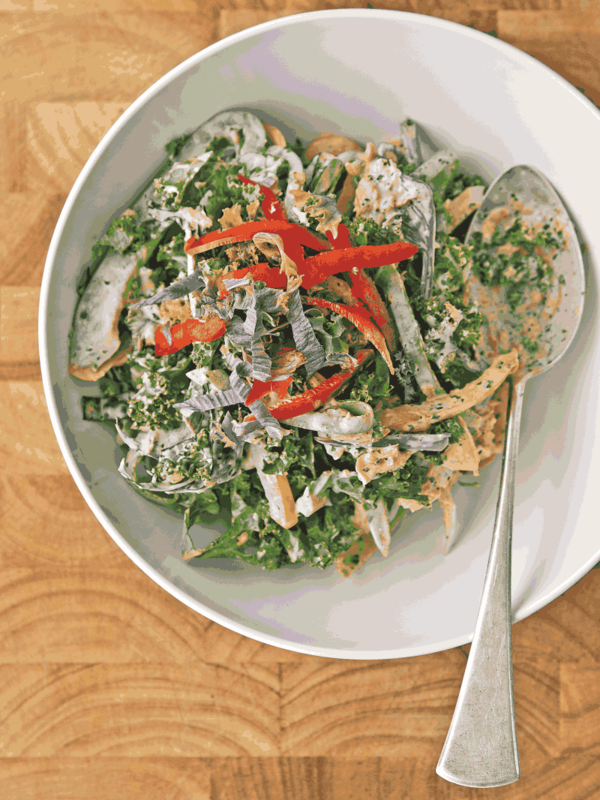 Shred the kale and carrots and transfer both to a large bowl. Add the bell pepper and Kale-onaise and toss well. Cover and refrigerate at least 1 hour or up to overnight before serving. DID YOU KNOW? When it comes to health, mayo gets a bad wrap because it's often a highly-processed food. But both traditional mayonnaise and modern canola oil based versions are healthy in moderation. 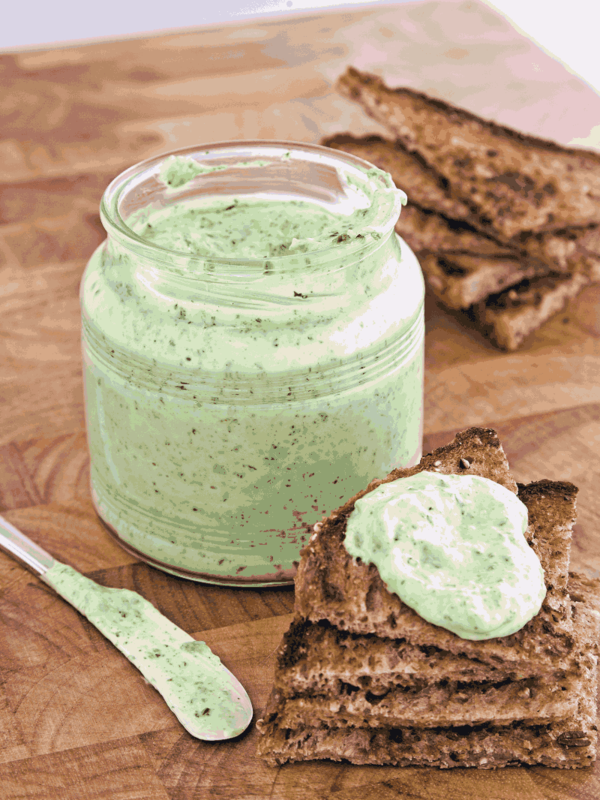 Most mayonnaise contains monounsaturated and polyunsaturated fats, two fats that are actually good for you. -- Place the sirloin, sea salt, barbecue sauce or steak sauce in a large bowl. Using your fingers, mix well and form the mixture into 4 patties. -- Fire up the grill or heat a large grill pan over high heat. Grill the burgers 10 to 15 minutes, until they are brown on the outside but still slightly pink (but not translucent) on the inside. 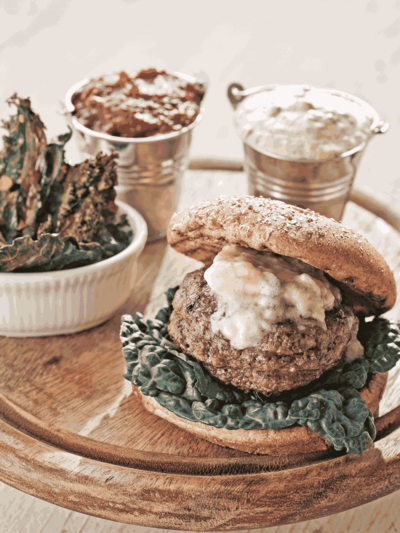 Top each burger with 2 tablespoons of the blue cheese. Transfer the burgers to a plate and tent with aluminum foil to keep warm. Add the kale to the grill for 2 to 3 minutes, turning often, until the kale is soft. Grill the buns halves for 30 seconds, cut side down. Remove from grill. 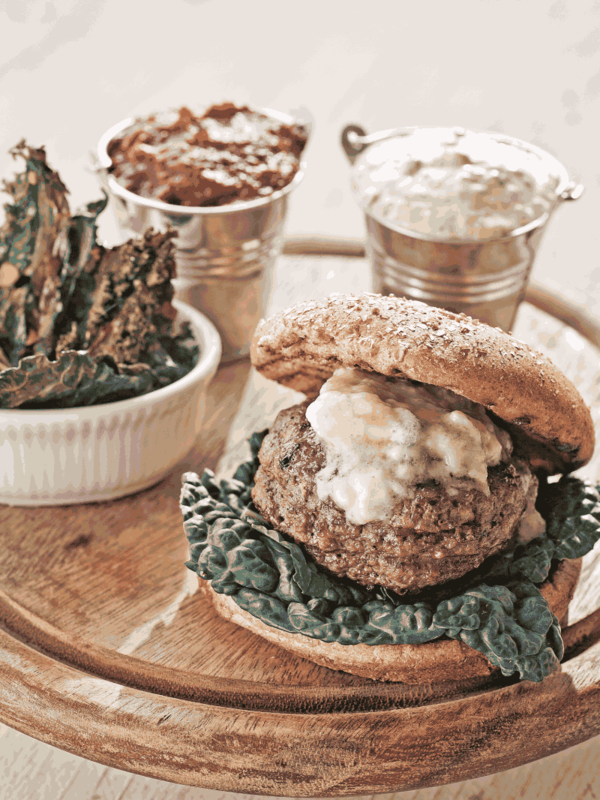 Assemble burgers, placing grilled kale on bottom bun with the burger and top bun on top. Serve immediately. DID YOU KNOW? If you can't find grass-fed ground sirloin, you can substitute with lean, grass-fed beef cubes and grind them yourself at home using a food processor or the grinder attachment on your mixer.